Ancient Amulet presents a Sacred Clay amulet, The Pra Leb Mer Pim Siarn Lone Sadung Glab in baked earthen Muan Sarn Sacred Powder Clay, with hand inscription on rear face (Thai ๖) . 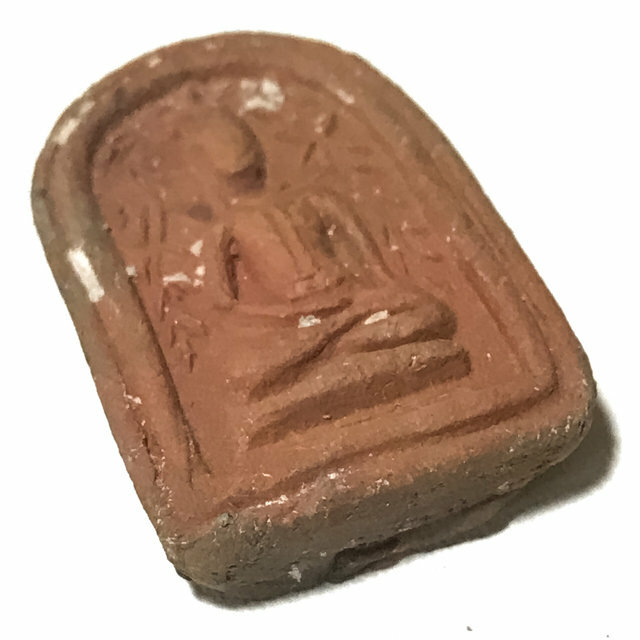 A rare and classic amulet from four generations ago, from the Great Master Monk of Olden Days, Luang Phu Perm (2429 - 2526 BE) of Wat Klang Bang Gaew, in Nakorn Pathom. This exhibit is especially sacred and desirable for the hand made inscription of Numerology Spell on the rear face. The amulet has Kraap Kru white cement adhering to it from the Kru Burial Chamber, adding even more character and prestige to this pristine detailed exhibit. The Pim was molded from a block press taken from the original Pra Pim Siarn Lone Sadfung Glab of Luang Phu Bun, to preserve the Wicha both in its design featurtes, as well as in the Muan Sarn Sacred Powders used in their making, which will contain a certain quantity of Pong Ya Wasana Jinda Manee. An olden days classic, of immense rarity, from the second of the four Great Masters of the Wicha Luang Phu Bun Lineage, in sacred earthen clay, with Ya Wasana Jinda Manee Powders added. The amulets of Luang Phu Perm enjoy the same level of appreciation as those of his predecessor and Kroo Ba Ajarn, Luang Phu Bun, and are amongst the most highly sought after, and difficult to find of the Masters of this Great Temple with so many consecutive Generations of Top Master Monks. Luang Por Perm followed the World Famous Dtamra Wicha Saiyasart the Great Luang Phu Bun, of Wat Klang Bang Gaew, inheriting all of the Wicha from Luang Phu Bun, and Mastery of the fomulas of the special and famously powerful Muan Sarn Sacred Powders of Ya Wasana Jinda Manee, and Ya Khamin Sek. These two powders, along with a large number of classic Buddhist Amulet models, and of course the Bia Gae Cowrie shell amulet, are special Wicha, for which the temple of Wat Klang Bang Gaew, and the lineage of the four last abbots of the temple are all world famous for. Luang Phu Perm and indeed all of the abbots of Wat Klang Bang Gaew, were the most famous Masters for the Wicha Bia Gae Cowrie Shell animist charm, whgich are legendary and extremely rare Pra Niyom category Talismanic amulets, most of which already reside in personal shrines, with their owners and wearers, and in High End Auction Rooms, fetching elevated prices. Their magical power is the major factor in what has brought the amulets of the Wat Klang Bang Gaew lineage all fall into the high end Pra Niyom Category, because of the demand and rarity of their acquisition, and the belief in their magic power. Chant this Kata 3 times whenever you are about to place the amulet neckchain over your head or put on the amulets, and also when you take them off. The Kata calls upon the power of the Buddha, Dhamma and Sangha to be with you and protect and Guide you.